Way back in the deep dark ages of antiquity when I was young, I remember being able to spend time on a somewhat regular basis with my grandparents, aunts, uncles, and cousins. True, we were all younger, and nana and granddad were alive then as well. And getting together was much easier because most of us lived within just a couple hours drive of each other. Christmas was a family reunion of sorts, where the men watched sports or talked cars, the women talked family and cooking, and the kids talked about how neat it was to play with cousins and reminisced about the time mom, Aunt, and six cousins piled in the old Dodge Dart, went to Pup-n-Taco and ate (collectively) about 50 tacos with hot sauce and 50 without. In the years since the holiday gatherings, our families have grown, grown up, and, it seems, grown apart. With some exceptions, family gatherings seem to center around who is getting either married or buried. Last summer we did have a picnic reunion, with much of the family able to attend. There were some cousins I had not seen since I was very, very, very young; and others that I had kept more in touch with. But at the same time, there were several who could not be there. 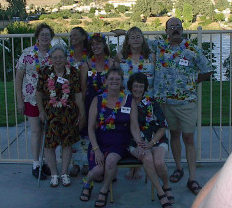 The last “reunion” had been at Auntie’s funeral, nearly three years earlier. Why so long between cousin sightings? Lots of reasons – money, work, distance, and time seem to be the largest common denominator. OK, so the in-person, face-to-face family reunion is not always a practical feat to pull off. For those who might not know, I’m part of a small blogging group, where we write from the same writing prompt week. Last week’s topic was “Family Reunions” and this week’s is “How Busy Is Too Busy?” (Since I’m running a bit behind in my writing, I decided to combine the two.) A few days before I sat down to write this, I posted a question on my Facebook status, asking what people thought about family reunions. Answers ranged from the amount of work and planning involved and the simple logistics of making one happen, to knowing that there are people weirder than themselves in the family, to the awkwardness of the whole thing. Awkward? A Coble thinks family reunions are awkward? You know, in a way, I agree with that Coble. It’s awkward to see people you haven’t kept in touch with in recent years. Life does get busy. Job schedules get in the way of our having fun. Kids and sports take up a lot of weekends. But I think there is a deeper reason why we feel awkward getting together over burgers and visiting in the park. We just aren’t as close-knit as we once were, or wish we were. We may be family by blood or marriage, but we don’t know each other. Relationship-wise, some of us are practically strangers. Oh, if we passed each other on the street we’d stop and talk a few minutes, but be honest. If we drew names for a gift exchange, how many of us could buy a personal, meaningful gift (meaning no cash or gift cards) without the aid of a wish-list or input from the recipient’s immediate family members? Here’s an idea. You can do whatever you want with it – take it as it is, ignore it, improve it, it’s all up to you. Remember the address book that you got at the reunion? The one that Aunt Martha made up, with everyone’s address, phone number, family members, birthdates – everything except for their underwear size? How many of us have let it sit in a drawer someplace? (My hand is raised. Sorry, mom.) Let’s put it to use. I’m not saying that everyone should send a card to every single person every week. I wouldn’t be able to keep a commitment like that, and I wouldn’t expect you to either. But, what if each one of us picked just one family member, or one family unit picked another family unit, that you don’t already talk to on a regular basis, and start a friendship with them? Send e-cards or facebook messages just for that person. Ask how they are doing, what struggles they’re going through, etc. If you’ve survived raising teenagers, connect with someone who is going through that, or about to go through it. Don’t be afraid to reach out. And for those who are blessed by someone reaching out to make friends, remember – it goes both ways. Reach back. Answer their questions. Families are supposed to laugh together and, just as importantly, cry together and comfort each other. Relationships and friendships don’t just happen on their own. It takes effort. It takes persistence. It takes intentionality. If the first person you reach out to doesn’t respond, then reach to someone else. You don’t have to choose someone in your own generation. There is no reason an aunt or uncle can’t start a friendship with one of their grand-nieces or grand-nephews. It’s OK to go beyond family and generational lines. That’s part of what made the holiday gatherings memorable. Let’s give it a try. What do you say?